Howdy. I've been busy trying to get out of a funk. Trying to stay motivated to keep running. Keeping up with chores. And trying to find my passion for creating. This little project took me about a week. Only because I didn't want to spend any money completing this project. I am seriously trying to 'use what I have on hand' instead of just buying more stuff. To display your American flag, the union jack is ALWAYS at the upper left corner, regardless of its vertical or horizontal. The union jack (blue panel) is made from denim. I machine washed it, to give it a soft feel. And then I machine stitched various red and white fabrics & trims. 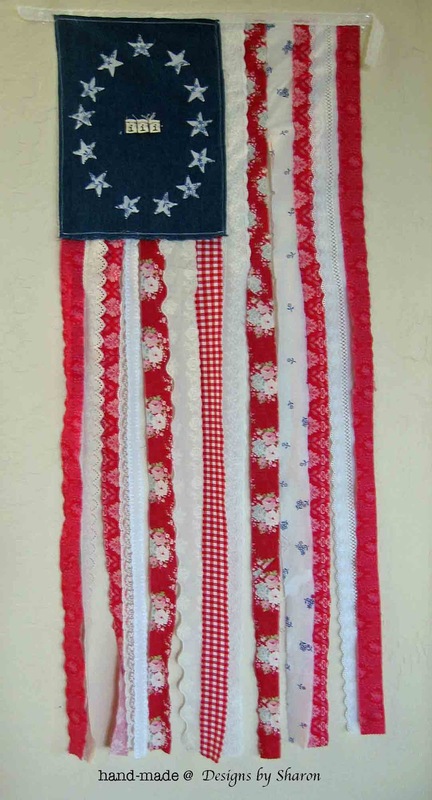 The stars were cut with a star die, using scrap pieces of the blue/white fabric in the flag. I wanted materials that looked vintage, or had that Americana 'feel'. I am happy with how it turned out. I just don't know 'how' to hang it. Any suggestions? The 3 I's in the center is for my family. My ancestors were part of the American Revolution. The 3 I's represent the 3% of Americans who originally fought against the British. After the war, these fighters were awarded land 'out west' as payment by our government. Thank you for your bravery! Some of the fabrics were not long enough, so I simply stitched pieces together, to create longer strips. I think that this piecing together, helps give it a 'worn' look. Thank you for stopping by. Enjoy your American Independence weekend. Thank a solider for their service & duty, and remember those who have sacrificed. Sharon, That is a BEAUTIFUL flag. I pinned it to my Pinterest page. THANK YOU for displaying it properly with the Union Jack in the upper left! We are flying our 13-star colors today! We hang it vertically over our front porch. You have to duck around it to get to the front door. Maybe you can hang yours similarly.